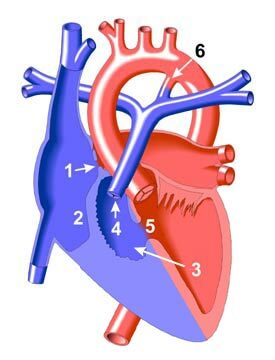 In Tricuspid Atresia, the heart has three valves rather than four. The tricuspid valve, which connects the right atrium (collecting chamber) and right ventricle (pumping chamber) in the normal heart, is abnormal and does not open. In addition, the atrial septum, or muscle wall, which divides the left and right atria, has an opening in it, called an atrial septal defect (ASD). This atrial septal defect is needed to unload the blocked right atrium and allows the mixing of blood from the right and left atria. The muscle wall, which separates the right and left ventricles, is known as the ventricular septum. In Tricuspid Atresia, this septum generally has a hole in it, called a Ventricular Septal Defect, or VSD. In addition, the right ventricle is usually quite small and the pulmonary valve, through which blood is pumped to the lungs, can be narrowed. This narrowing of the pulmonary valve is known as a stenosis.